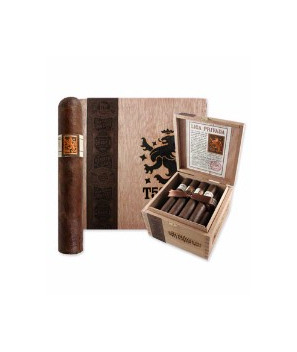 The Liga Privada T52 Toro cigar is a member of the Drew Estates family. The first brand that comes to mind when someone mentions Drew Estates is the ACID line, right? In case you've been living under a rock the last few years, you can throw that “all Drew Estates cigars are flavored,” notion out the window. Originally developed as a private blend for Drew Estate President Steve Saka this cigar is like waking up to a brand new day. The Liga Privada T52 is filled with a blend of Honduran and Nicaraguan tobacco, bound by a Brazilian Mata-Fina leaf, and lovingly cradled in an extra oily stalk-cut Connecticut Sun-Grown Habano wrapper. Each cigar is hand-rolled and then left to age for at least 1 year before being shipped to distributors. The Liga Privada T52 is a Full-bodied cigar that pairs itself best with a rather hearty meal. Full of flavor as well this is one cigar to not take lightly. This cigar has a flavor profile all it's own that you'll reach for time and time again as you try to pin down exactly what kinds of chocolate, coffee, pepper, leather, spices and all the other flavors you are tasting. These flavors have their own richness that many other cigars just can't hold a candle to.